Speed booster apps have always been a popular section of apps for Android, and are only becoming more so due to the fact that devices get older and slower with newer versions of the Android operating system. Any device you get, even the latest and fastest phones and tablets, will eventually get bogged down by a combination of the OS, lack of memory and bigger and more resource intensive apps. So, speed boosters are pretty essential for many users, but they do have their problems. A personal gripe is that I find that many of them are bereft of usability and lacking polish, but many users find them utterly baffling. DU Speed Booster is a little bit different. It combines a gorgeous user interface, one of the best of any class of app on Android, with a raft of features that, crucially, makes sense to the average user. You are not going to need a rooted device or need to know what a kernel is to use this app effectively, and it is also completely free, and for the gamers out there, it is particularly effective. There is a specific ‘game booster’ tool built in that recognises that a game is running and automatically concentrates the system to get that app running as smoothly as possible. Don’t panic, this isn’t hard to do it is just a button press and the app does its magic. If a game goes unrecognised by the app (I couldn’t actually get it to miss one) you can also manually select a game. There is also a more general optimiser that will get your phone running very smoothly indeed with a button press, which can also be achieved with a tap of the included widget. 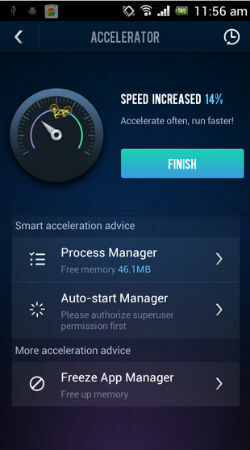 In addition to the speed boosting and system management, the app includes a trash cleaner to keep your memory as clear as possible and superbly, a complete App Manager that allows you to transfer apps between your main memory and SD card and batch install and uninstall apps and data. Seriously, there are apps that charge a lot for these features alone, as well as the included permission manager and call and SMS blocker functions. Really though, most users just want an free app to speed up their phone with the minimum of fuss, and DU Speed Booster does this, in an attractive and easy to use style, whilst also having the extra functions sitting there, ready to use when you need them. In fact, this could easily replace three or four other paid apps on your phone – for free. For the ease of use, good looks and effective operation, this would be highly recommended, but with all the extras and free price point, this is an essential app.